Great Sand Dunes National Park & Preserve was the first stop on our 8-park adventure this summer. Our time here included hiking, trying out some sandboarding, and enjoying the peace and quiet that comes with visiting one of the lesser-known national parks. Stay: The Great Sand Dunes Lodge is located right at the entrance of the park, walking distance from the only restaurant in the area. All rooms come with a patio overlooking the dunes – great for enjoying the sunset with a beer. Do: Hike to the top of High Dune, the highest point on the dune field. At almost 700ft tall, it makes for quite a climb. Once you wade through Medano Creek, there are no marked trails so you are free to make your own itinerary to the top (our hike ended up being 4 miles round-trip). Make sure to go early in the morning before the sand gets too hot or afternoon thunderstorms develop. Do: Go sandboarding or sandsledding in the dune field. We rented our boards for the day from the Great Sand Dunes Oasis. It’s definitely more challenging than it looks! Do: Hike the Dunes Overlook trail (moderate – 2 miles r/t) to get a good perspective of the dune field, Medano Creek, and the San Luis Valley. 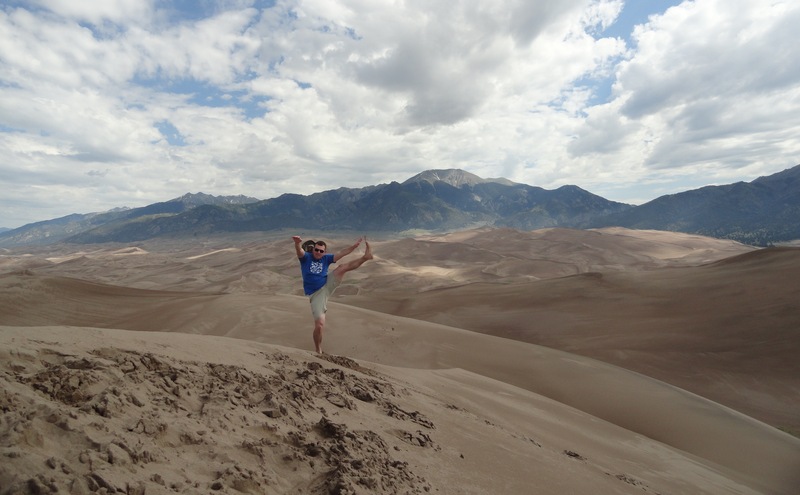 This entry was posted in High Kick Photos and tagged Great Sand Dunes Lodge, Great Sand Dunes National Park, High Dune, High Kick, sandboarding. Bookmark the permalink.